Though only reigning for nine years, Henry V is one of the most famous monarchs that England has ever had. Unusually for his time, Henry V was born the son of an English father and an English mother: he was, in the truest sense, an English King. In the aftermath of his father’s reign, he calmed the vying factions of nobles and united the whole of England, before leading an almost exclusively English army against the ancient foe upon the field of Agincourt. Henry V would become the archetypal national hero, his rule, his verve, and his ideals becoming the very idea of England and giving rise to something greater: the idea of national patriotism. To this day he is still seen by some as the originator of some of our greatest forces, a restorer of the Navy, and a founder of military, international and maritime law. This is the first biography I have read of Henry V. Needless to say, much of my previous experience comes solely from Shakespeare. I have, however, just completed a MOOC on the battle of Agincourt since it's the 600th anniversary this year, and it was that more than anything that made me request this book on NetGalley. Overall, I found it an enjoyable read. The prose was easy going - detailed but not in a stodgy, textbook style - and the chapters were good lengths for me to read one per session. I knew a lot about Agincourt from the MOOC, but it was interesting to learn more of Henry's later expedition in Normandy. I particularly appreciated the chapters that focused on separating myth from fact - with a focus on what is known of Henry's youth, and his relationship with his father. 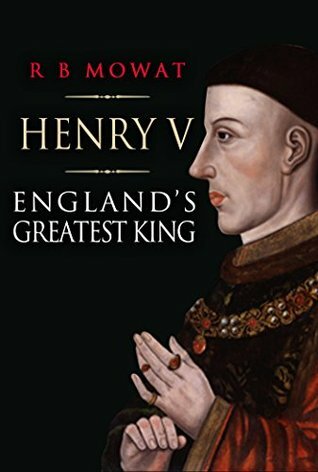 In conclusion, this book was a very pleasant read, and it is a good starting point for those who, like myself, are making a first foray into the life and times of Henry V.